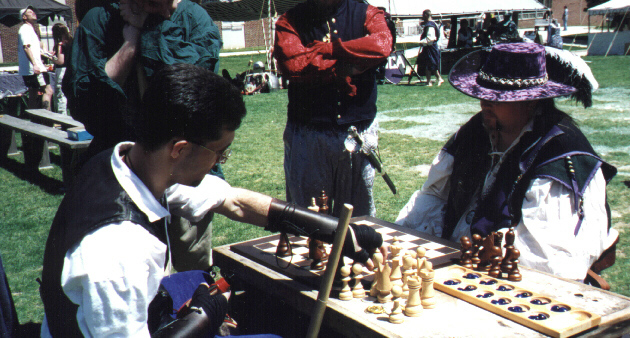 The Annual Renaissance Faire will be held on May 6th through the 7th, 2000. This is a change from the normal one date faire. We have stretched it by suggestion of the vendors and performers. Let's just hope we don't die for it. It also has been moved from the DMZ to north campus at Lytle Field. This was also by suggestion. We are very excited about this years faire not only for the changes but for the cast, crew, and script. The Plot: Two twins brothers declare themselves to have better taste than the other. The noble lord fancies the court players while his brother enjoys the simpler lifestyle of the peasant traveling troupe. Both are set to proove the other wrong. Thusly the faire begins. Both troupes will do performances during the day. The conflict will climax when the two troupes prepare to do their scenes only to be set on the same stage. Hilarity ensues and the conflict is resolved by way of.....you'll have to come to find out. I can't give away everything. The Entertainment: The traveling and court players will present various theatrical performances during the day. Minstrels will be wandering the faire grounds. Magicians will fill us with wonder. A mock trial of a wench, who will remain nameless, will be done. Storytellers will entertain us. The House of Temptation's Middle Eastern Dance Troupe will tempt us. And much more to be added. The Vendors: Many vendors will be gracing us with their presence. Eclectasy - oils, garb, etc.